So much is happening in the July garden that’s it’s difficult to focus on a single plant to report on. So this month I’ll talk about one the foundations of landscape planning: hardscapes. A “hardscape” is a level, two-dimensional hard surface that covers the ground. In other words: driveways, walkways, and patios. When planning a garden—or renovating an existing one—hardscape is one of the first things we look at. Perhaps the most popular garden hardscape project is a patio, so we’ll consider that example. Make notes so we can accommodate, or at least prioritize, the most important factors. 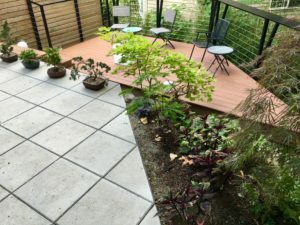 If you are replacing an existing patio, make note of its appearance (such as wear or damage) and any drainage issues that might have come up during the winter and spring. The more you are aware of possibilities (and problems) the better prepared you are to make design choices. The next step is to look at materials. Consider your budget, your planting plan, and any structures you plan to add as part of the project. Materials for hardscapes include natural stone, tile, pavers, and aggregate—as well as modern solutions such as concrete. There are many choices, each with benefits and limitations. A qualified garden designer can help you evaluate all your options. 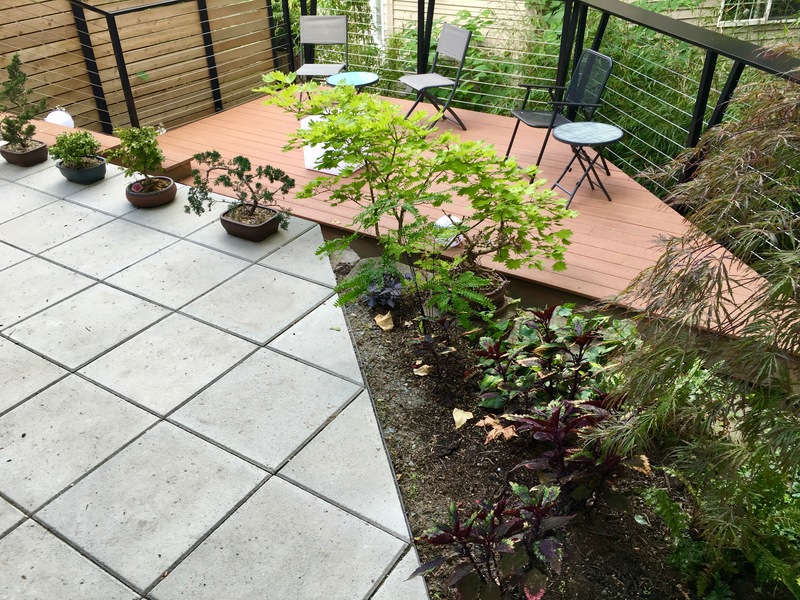 Summer is a great time to start planning for a new patio. Renovation of existing hardscape, or construction of new hardscapes, can be done year ’round (except when the ground is frozen or exceptionally muddy). Plan now, and you could enjoy a more attractive garden next summer. Call today for a consultation to discuss options for enhancements, renovations and materials for your new hardscape. This entry was posted in Blog and tagged drainage, hardscape, landcsape design, outdoor space, pavers. Bookmark the permalink.